And THIS is definitely one of those times! Researchers say they’ve crawled their way into a new cure for arthritis knee pain. And I have to admit, it’s pretty unique. But I also have to warn you… it’s ALSO pretty gross. It might even make you a little queasy, especially if you don’t like critters with lots of legs. No, I’m not trying to bug you out. 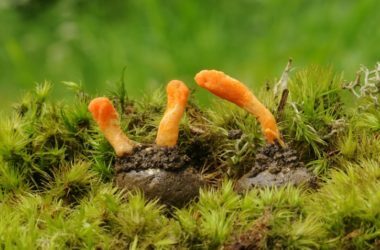 But researchers right now believe the best hope against knee arthritis pain is in something called Cordyceps militaris. First, it takes them over… then, it kills them. More importantly, it also works differently than painkillers. Which means it might be especially helpful for people who get no relief from meds (which is nearly everyone with arthritis knee pain, eventually). With promises like that… and not a drug in sight… you have to at least take it seriously. It’s only been tested in animal models, not people. And there’s also the fact that it’s, well, caterpillar fungus. Let’s face it, not everyone has the stomach for that. And if the idea of taking something called the caterpillar fungus doesn’t make your skin crawl, the price might. Since it’s rare and already in demand as a “medicinal mushroom” by people in the know, it can cost up to $63,000 a pound. That’s even more expensive than some of Big Pharma’s astronomically priced meds. Fortunately, you don’t need to pay the outrageous price OR give yourself the willies to get real and lasting relief from arthritis knee pain. There’s an easier answer – no caterpillars and no funguses needed. The REAL reason so many people get no relief from common arthritis treatments is that NONE of them attack the true cause. And that’s the disintegration of the joint itself. Some might slow it down. Some might make you notice it less. But the end result in every case is MORE degeneration and MORE pain. That’s why it’s time for a new approach. Not something as “out there” as a caterpillar fungus. But just giving your body the building blocks it needs to replace and restore what’s being lost. Start with hyaluronic acid, which is essentially the “shock absorber” inside your knees, and chondroitin sulfate, which helps to form the cushion around your cartilage. Either one is a great start to help tackle knee pain… a formula that contains both is even better.